You are here: Home > Learn Spread Betting: Training Course > Why trade UK shares? there been a better time to make full use of these tools, since markets remain febrile in the wake of the global financial crisis and the nimblest investors are best placed to profit. Do your homework and weigh up the pros and cons of the various investment instruments at your disposal and you only increase your chances of making money. Most people should not. In fact, if you are unable to commit to at least 1 hour a day and a few hours on the weekend to researching companies and looking after your portfolio for the first 12 months, then you definitely should not. For those with the determination to succeed, I advise at least 6 months practice (by signing up for a demo account) before committing your hard earned money to a single trade. It can be worth it; the stock market can offer you greater returns from simply putting your money in the bank and earning interest. Consider the following example. Cash ISAs are currently providing around 2.5% a year on your money (May 2011). The advantage of this is that your money is safe (virtually risk free) in a bank and will not lose value (discounting inflation) and will simply grow in value by 2.5% each year. Put another way, for every £1, after 12 months, you will receive £0.025 or 2 and a half pence. 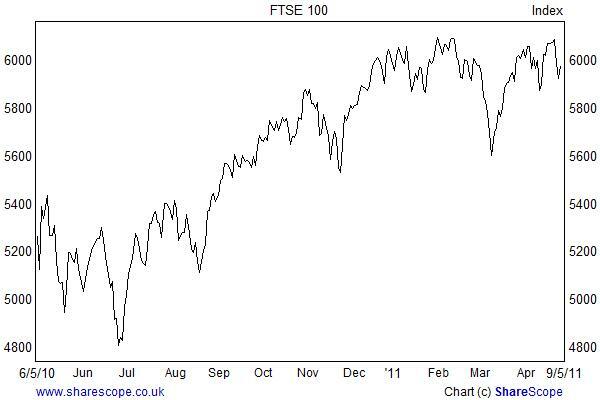 The UK FTSE 100 between April 2009 and 2010 rose in value by 30.77%. For your £1 invested in the FTSE 100, after 12 months you would have received £0.307 or just under 31 pence. That is a huge difference in returns. But of course, placing your money at the mercy of the stock market is not risk free like keeping it in an ISA. The pay off for putting your money at risk is greater returns. The main disadvantage of trading is that the value of the FTSE (and shares) can go down as well as up. The value of shares do not necessarily go up or down in a straight line either as the chart on this page shows. Hopefully, you have the commitment to work at trading to achieve greater returns for putting your money at risk. What Determines a Share’s Price? Now that is a tricky one but really a share is worth whatever people are willing to pay for it. Think about it, would you rather buy shares into a company that is increasing sales and profits or one that is loss-making and is experiencing decreasing sales? Most would choose the first company, and if many people want its stock, the price will rise. A stock market also tends to react to news. If Apple announces that its latest iPhone 5 phone is selling like hot cakes, we can reasonably expect Apple shares to go up. Investors are always looking to anticipate such news. However not all news is upbeat. If a company announces a profit warning that would be bad news and many investors would prefer to sell a share before it starts to fall sharply. Shares (sometimes referred to as stocks) are units into which the ownership and the market value of a company is divided. For example, Tesco (TSCO), at the time of writing, has approximately 7,930,810 shares available on the London Stock Exchange for anyone who wants to trade them. That basically means that the management of Tesco and their advisors have allowed nearly 8 million shares to be traded. In theory, if you wanted to own Tesco as a 100% shareholder, at the current share price of £3.66 per share, it would cost you £29,026,764.60, give or take. Luckily for us we do not need to find millions of pounds to buy shares of Tesco if our analysis concludes that we should. We could simply buy a spread bet. As units of value and ownership, shares provide traders with the ability to participate in the stock market. Spread betting firms will provide a price based on the same value as a Tesco share so that traders can trade the price of Tesco shares without having to go through the complexities and commissions of owning the shares. Instead, when you open a spread bet you do not actually own the shares. You own a spread bet which rises and falls in value in line with the actual stock market price of the same company. It is a promise between you and your spread betting provider that you will both honour the value of the spread bet when it is closed whether it has risen or fallen in value. There is a quick example of a spread bet on the next page.